He slowed to 120 kilometers per hour and we sat quietly wondering who was going to blow first. About halfway back we needed to pull over for petrol. Zaher had a hard time keeping his foot from pressing the pedal. The ding, ding, ding would come on and he would jokingly shush it as the car decelerated. Suddenly we came to a complete stop. At least two kilometers ahead of us, the mountain highway was a parking lot. We waited in one of the two lanes of traffic. After twenty minutes of not moving, Zaher could not take it. He turned right and started driving down the road’s shoulder. He kept looking out into the desert. Other four-wheel SUVs had already pulled out of the traffic and were crossing the desert to a dirt side road. With the low Camry, he had to wait for the right opportunity to pull out into the desert. That kept him from driving into the desert. Instead he continued driving on the right hand shoulder passing all the other cars. Several cars began following us. An ambulance came up from behind trying to get through to the accident. It slowed to a crawl because the line of cars Zaher led on the right hand shoulder blocked its path. Zaher forced our car back into the traffic leaving just enough for the ambulance to scoot through. As soon as it passed, he pulled right again and followed closely behind. It sped ahead only to be stopped completely by another white Camry. The white Camry did not move out of the way despite the ambulance driver trying to use the siren to push it out of the way. We did make progress following the ambulance. Finally the white Camry pulled back into the traffic, creating quite a pile-up. I am somewhat used to this type of driving. I decided if he doesn’t care, it’s not my car. If it gets dented…. Still I could not keep my mouth shut. The police officer was waving for the white Camry to get out of the way to make room for the ambulance. The ambulance got through and the officer seemed to be writing the guy a ticket. Zaher pulled left between two large trucks. He squeezed in between the bumpers that were even with our heads. I didn’t say anything. I thought, I am not his mother. I am not his employer. I am not his wife. He began weaving and maneuvering into the left hand lane, forcing his way around the trucks. Once in the left lane, we discovered the police were funneling people back into the right lane. Zaher negotiated his way through and around the cars, waving and beeping, forcing them to halt and let us through. No dings, no hits. We finally got to the ten car and the one hundred air conditioner accident. A large truck carrying air conditioners fell over while swerving to miss a five car pile up in front of him. People were strewn across the road holding their heads. “Wow wow wow,” said Zaher as he slowed to three kilometers an hour to look at the damage. As soon as we passed the mess, he pressed the gas and we were at 150 – ding ding ding ran the bell. But he didn’t care. Five kilometers flew by before we were suddenly in another traffic jam. “What is going on?” he said. Tired of being a tour guide, he pulled his ghuttra off his bald head and threw it down on the center brake and unbuttoned his top button. Now he was the real Zaher. Again he started pushing his way through the traffic until we were absolutely stopped by a big jam around a huge tanker that had turned over in the road. The tanker was so large a huge crane had been set up in the road to hoist it from the ground. The crane operator had to have nerves of steel as he lifted the tanker. Cars filled with families sat within a foot of the crane beeping and swerving around its braces as they squeezed their way through the traffic. Police officers tried controlling the chaos but people drove in literally every direction to get around the crane. Zaher managed to get around the crane and sped into Muscat. As much as Zaher tried, he could not outwit the traffic. We found ourselves at six-way intersection with cars standing still in virtually every direction. Instead of waiting behind the line where the traffic light stopped us, Zaher plunged into the middle as soon as a tiny space was made. We were surrounded by a sea of cars. No one could move as no one gave an inch. We sat in the intersection for about fifteen minutes through at least eight changes in the traffic signal. Absolutely zero cars moved. Suddenly a space opened up. The police had arrived. Gesturing and shouting, they got the unruly drivers out of the intersection and back to following the lights. Within three lights we zoomed through the center of the intersection, made a left and found ourselves on the road to the Crown Plaza. We pulled at 6pm. Not bad, our itinerary said we would return by 5pm. I really didn’t want to congratulate him on getting us back so timely as I didn’t agree with how he did it. I didn’t complain though and we tipped him well. “Usually I am back here by 3pm,” he complained. I didn’t take the personal business card he offered. We bid good-bye. Inside, Goldi and I washed up then headed down to the pool side bar to recover from our day. The next morning, I really couldn’t imagine Sultan Qaboos was happy when he read about both accidents in the newspaper. It was barely three months after Traffic Safety Day. 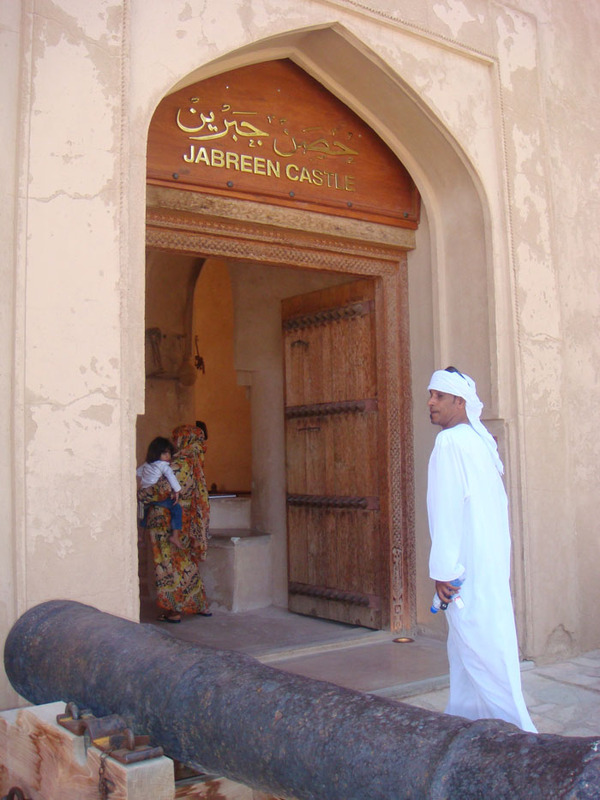 Our final destination was Jabreen Castle. 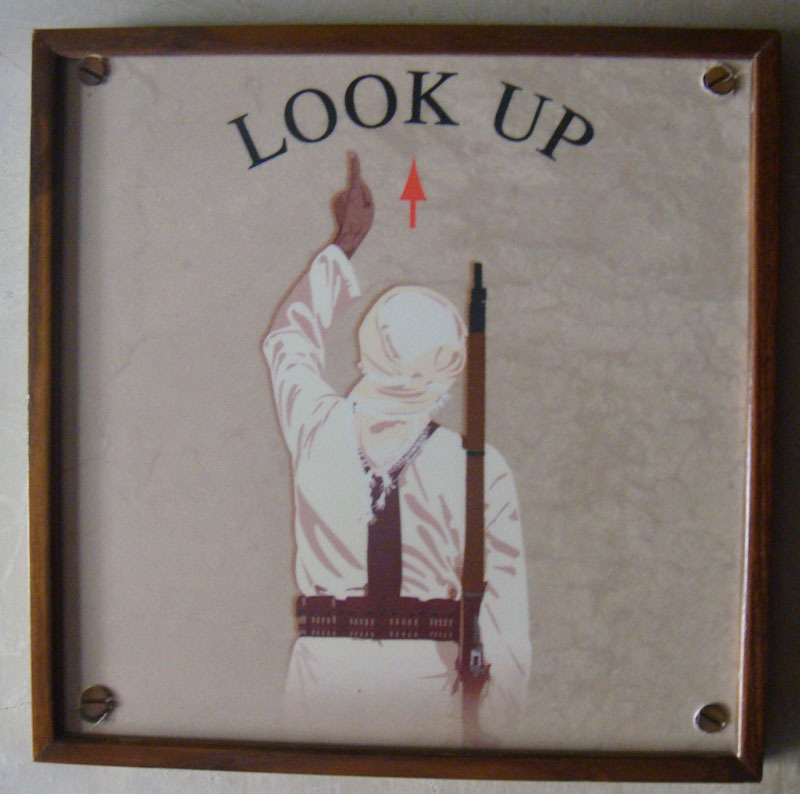 Afraid he was not going to get a tip, Zaher led us through the castle pointing out the signs on the walls. 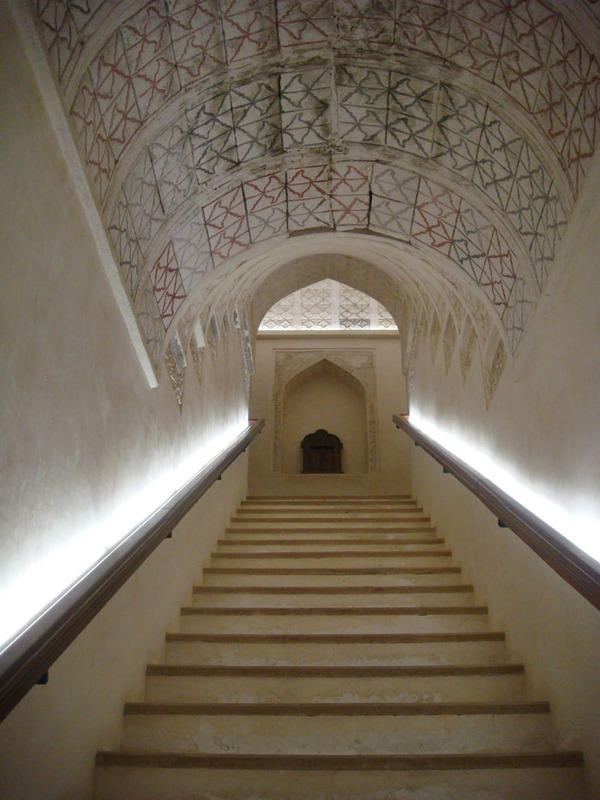 The renovated fort/palace/university was built in the 15th century. Throughout the castle, the rectangular rooms were similar with low windows that opened near the floor and high ceilings that vented outside, naturally cooling the rooms. 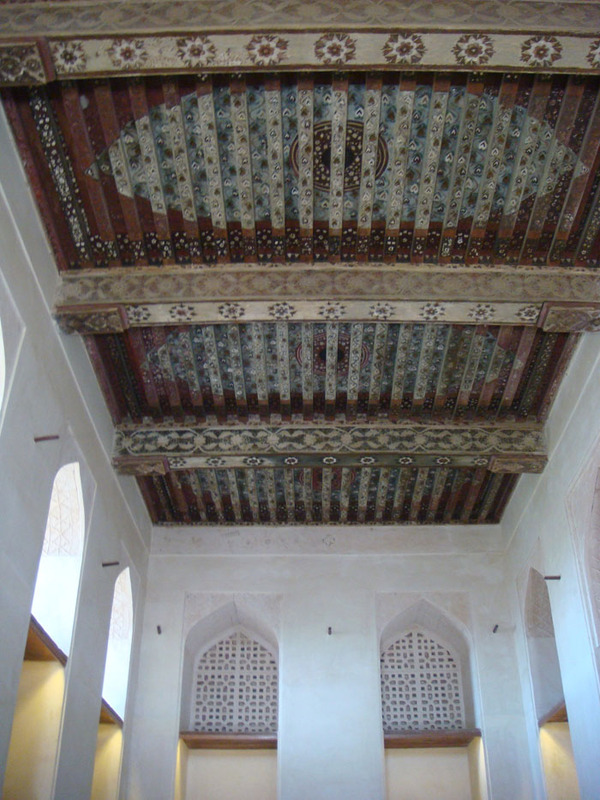 The beautiful, recently painted ceilings looked like carpets. We wove through the maze of rooms. The interiors were similar but the views were great. Eventually we made our way to the highest rooftop that overlooked the valley. A French TV camera was taking pictures of the Omani flag waving in the wind. We took the same photo and chatted with the tourists. 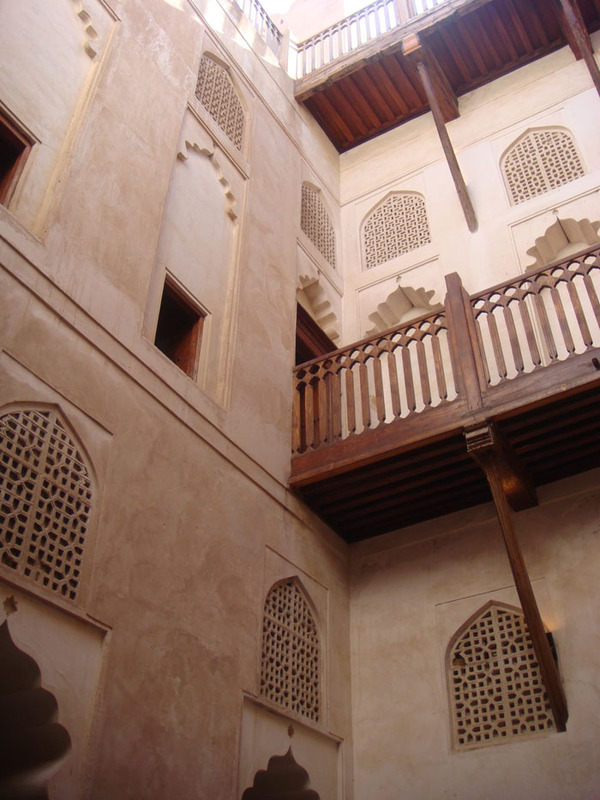 An Omani man was lecturing his maid (seen in the first picture at the castle door), his wife holding a newborn and his five children under the age of seven on the palace architecture. 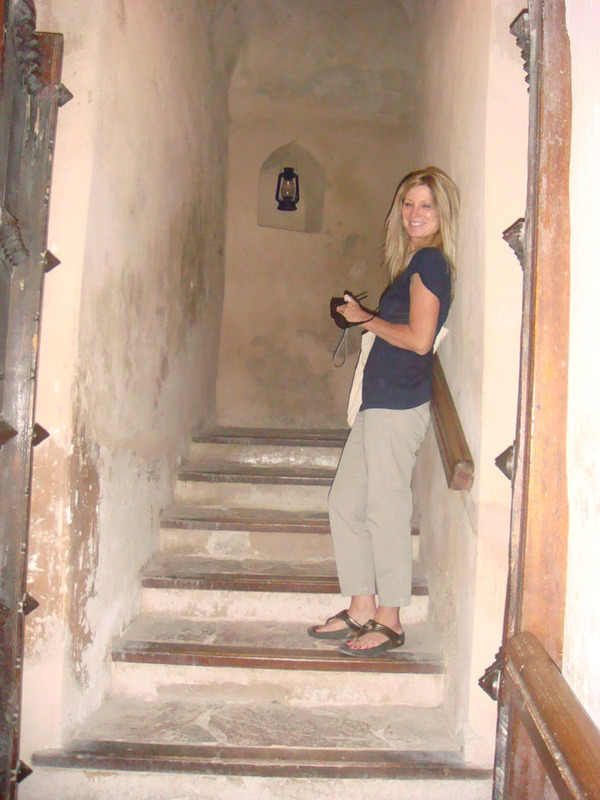 When he saw Goldie and I walk through the doorway, his eyes lit up. He left his family and made a bee-line to us. We were the audience he was looking for. 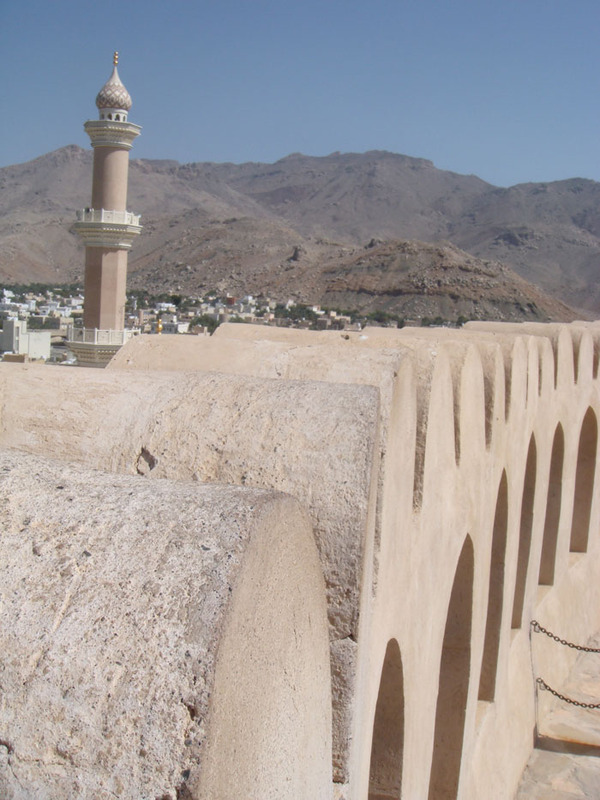 Before we could say salam, he began telling us about the architecture. Unable to add to the conversation, Zaher sat on the side strumming his fingers. After a half an hour of his time, we thanked him and he thanked us. We moved on trying to take artistic photos that might make us famous. 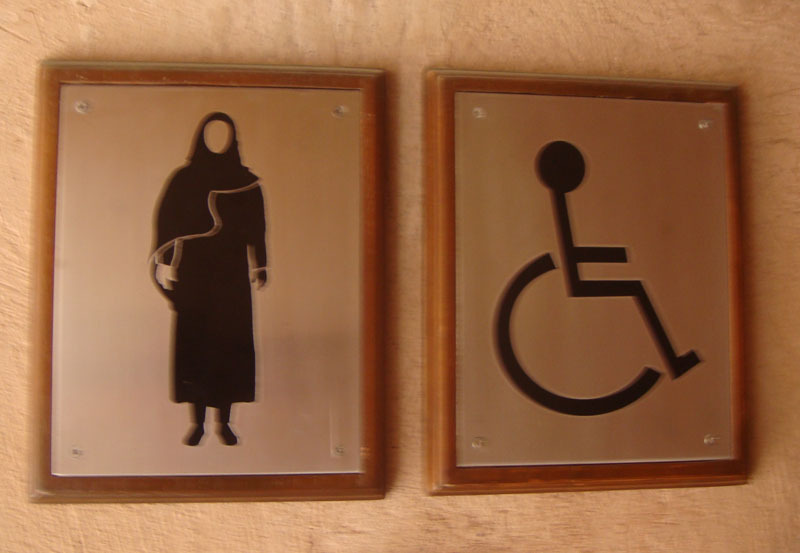 As we left Zaher asked if we needed the ladies room before our hour and a half drive back to Muscat. We started our drive back to Muscat. It didn’t seem like enough difference to make a distinction between the sects. Zaher said “I am not a good Muslim” and admitted he did not know what the deeper differences were. At home after doing some research I understood Zaher’s description better. O’ Allah ! I seek help from You, ask forgiveness from You, and believe in You and praise You for all the good things and are grateful to You and we part and break off with all those who disobedient to You. O Allah, You alone do we worship and pray exclusively to You and bow before You alone and we hasten eagerly towards You and fear Your severe punishment and hope for Your mercy, for Your severe punishment is surely to be meted out to the disbelievers. Ibadiyyah practice barā’ah: dissociation (but not hostility) towards unbelievers,sinners, and those destined for Hell. They believe in wuqūf: reservation towards those whose status is unclear. This view allows for them to have quiet interaction with others, but not in a way that causes strife or disagreement. This underlying belief probably explains some of Zaher’s casual “Maybe this or maybe that” attitude. Zaher admitted he had never even traveled to any other Gulf country so he really didn’t know any Muslims besides the Ibadiyyah. 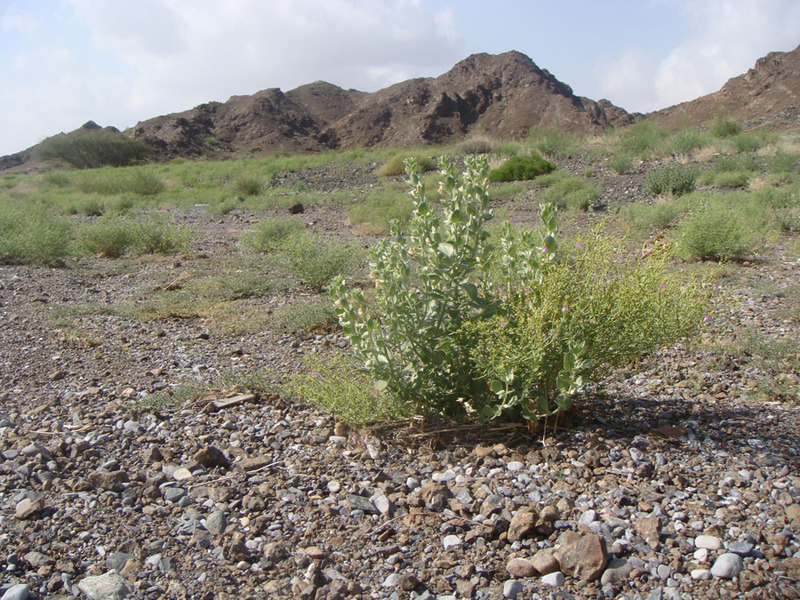 Like his forefathers, Zaher was isolated – and protected – from the other Gulf countries by the Hajar mountains. We rode in silence observing the countryside. There were quite a few newer, two and three story villas near the road. I finally understood what he was saying. The small villages were expanding and we were seeing the new houses being built on the outer circumference. “What is the population of Muscat today,” I asked thinking about the new roads and houses that seemed to be popping up around the countryside. “5 million?” That sounded very high. I pulled out our guide book. “Wow,” I said. “This guidebook was written in 2003. There were 2.3 million then. In less than ten years the population has doubled. That is amazing. 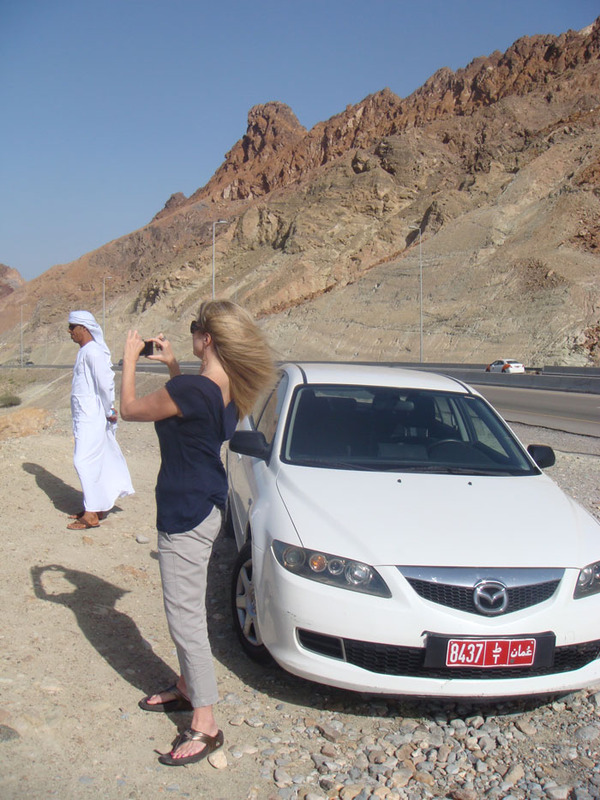 Why are so many people coming to Oman?” I asked. “Some people they come and some people they go,” he said in his non-committal way. 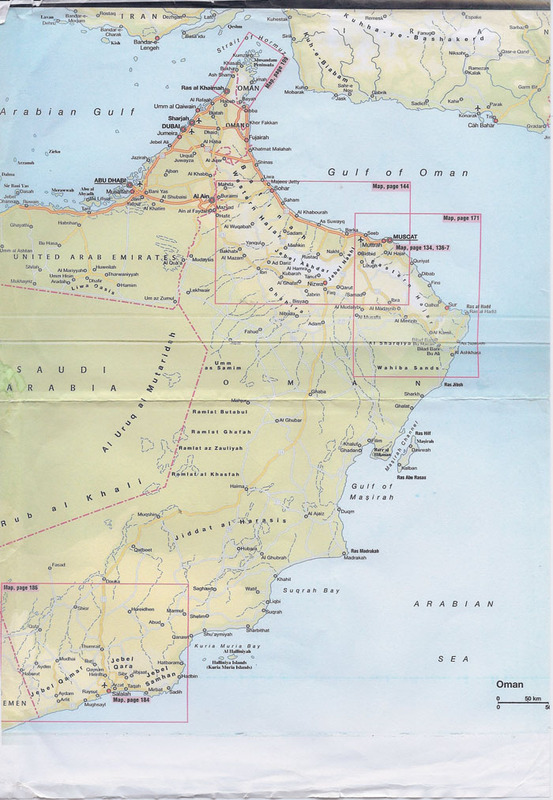 Later when I checked out Oman’s population, the World Bank’s estimate was 2.78 million in 2010. 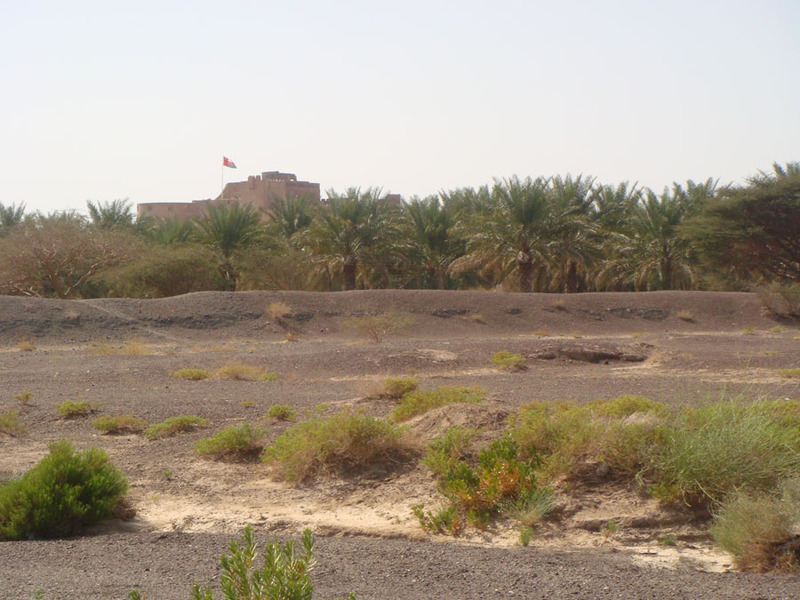 Our 2003 guide book said that Bahla Fort was the largest fort in the area and was not open due to renovation. Eight years later Zaher confirmed we still could not go inside. 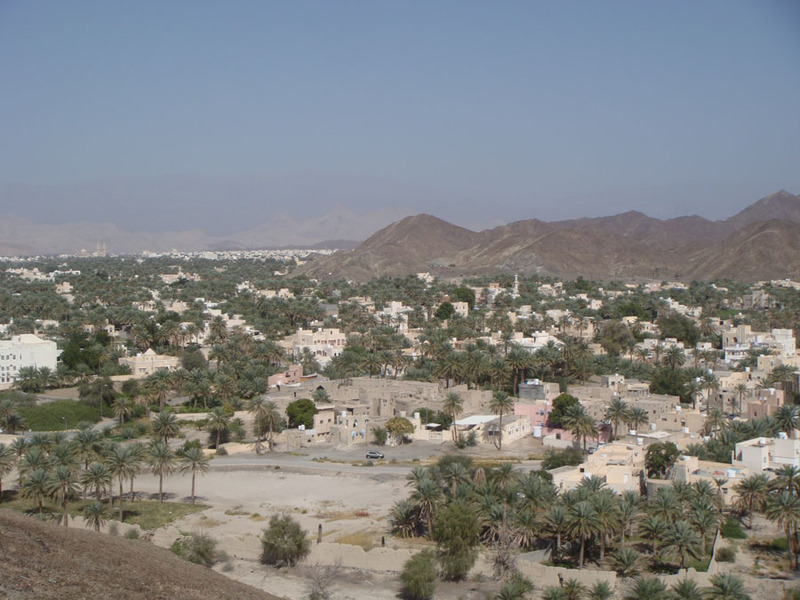 Although my guidebook said the village had many interesting ruins, a great souq and nice palm plantations, we drove up the mountain where the tv antennae facility sat to get a good view and take pictures. 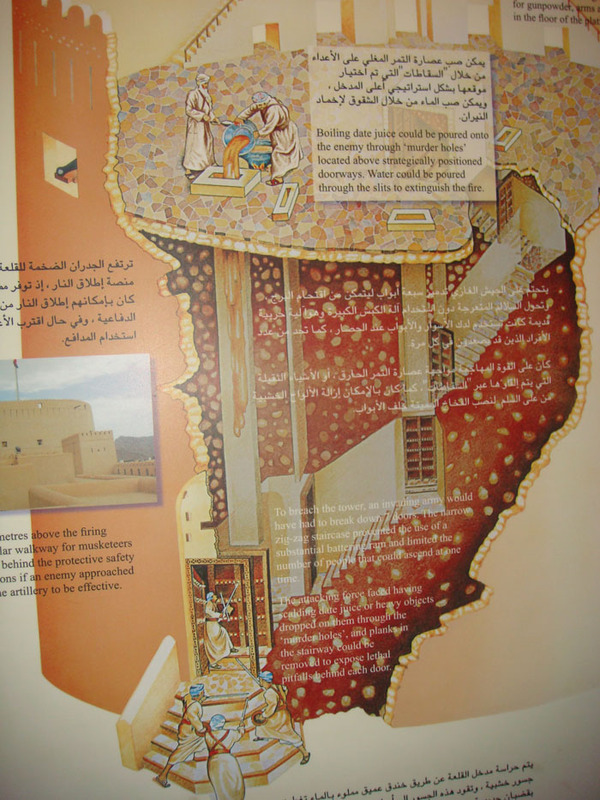 Also, according to my guide book, Bahla was actually about 46 different villages. 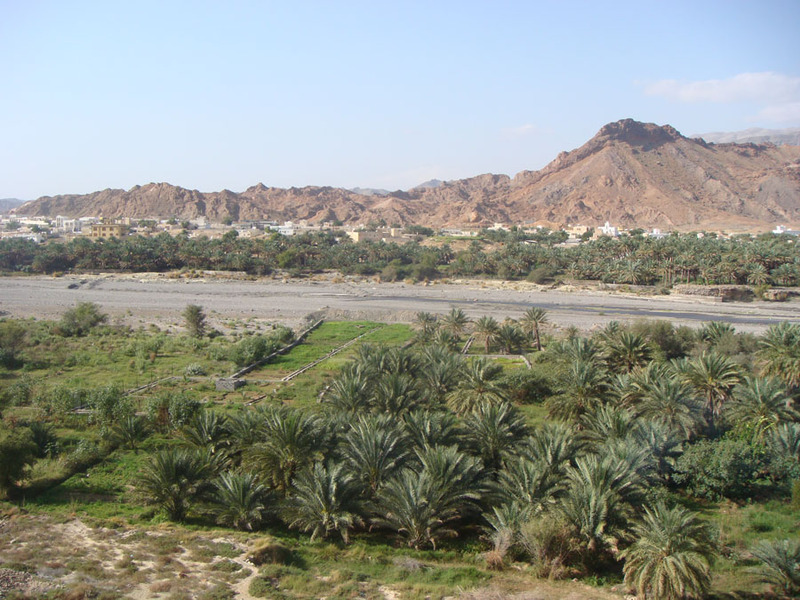 It is believed to the oldest inhabited town in Oman. Archeologists found some artifacts dating back to the third century BCE. 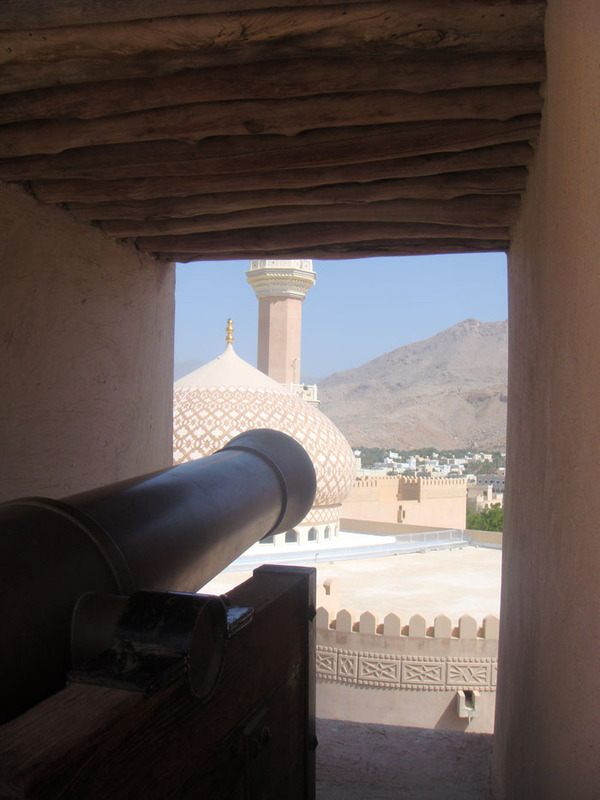 Finally a little Omani knowledge that was not included in our guidebook came out of Zaher. “Jinns?” Jinns are ghosts in Arabic. “They must be very good people if the jinns want to protect them,” I offered. “Then perhaps the jinns don’t want the fort rebuilt. Perhaps they are afraid the people are preparing for war,” I suggested. The village and the fort were picturesque. We climbed back into the car and made our way down the hill. At the bottom of the hill, we passed a cemetery – a flat-ish area with stones unnaturally turned on their sides. The work of jinns? “Did you like the fort?” Zaher asked us. “What is the difference between our options,” we asked. Lunch was included in our tour package. “Whatever you like – here or there,” he said in his completely uncommitted manner. We hemmed and hawed. He finally offered a difference. “Bahla it is,” we agreed. We could miss the authentic experience in order to sit more comfortably. We drove to Bahla the car ding, ding, dinging the entire way. 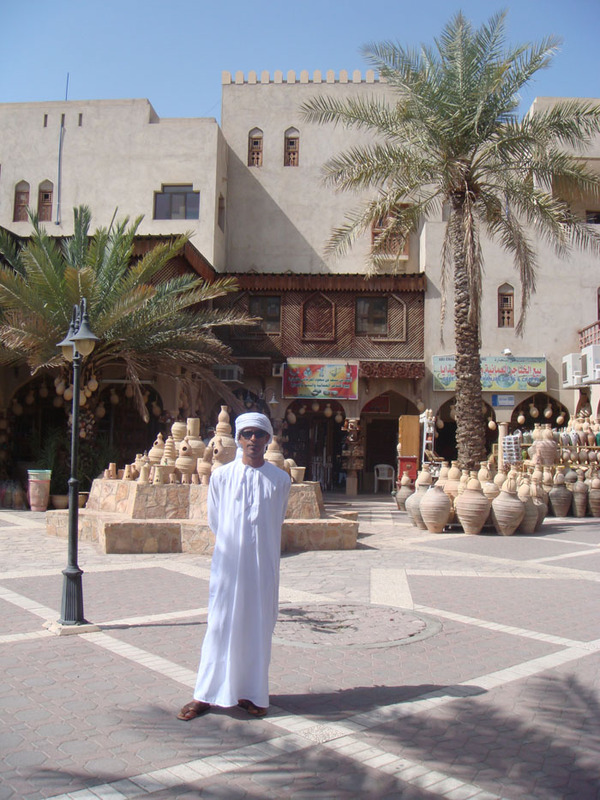 We continued to ask questions about Oman. 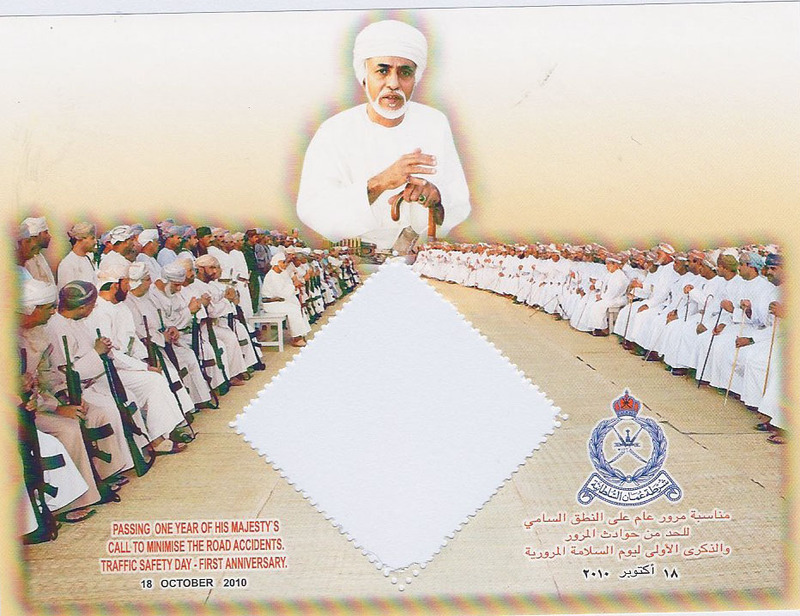 “Sultan Qaboos. He came into power in 1970s?” I began. “Does he have any heirs?” All royals need heirs. “Nobody knows. Maybe he has some children, maybe he doesn’t. We don’t know. We don’t know,” he said. He was clearly uncomfortable talking about the Sultan so I quit quizzing him. The drive to Bahla was quick, like less than fifteen minutes. 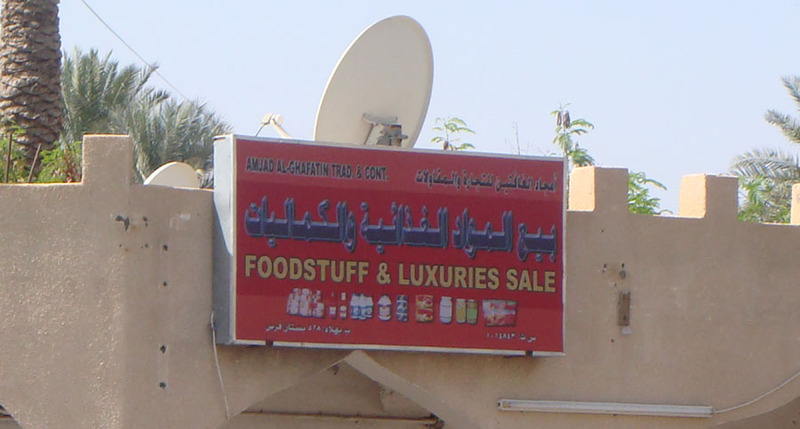 Across the street from the “Foodstuff and Luxuries Store” we pulled into a spot facing the oncoming traffic and parked. The road side café was very simple. 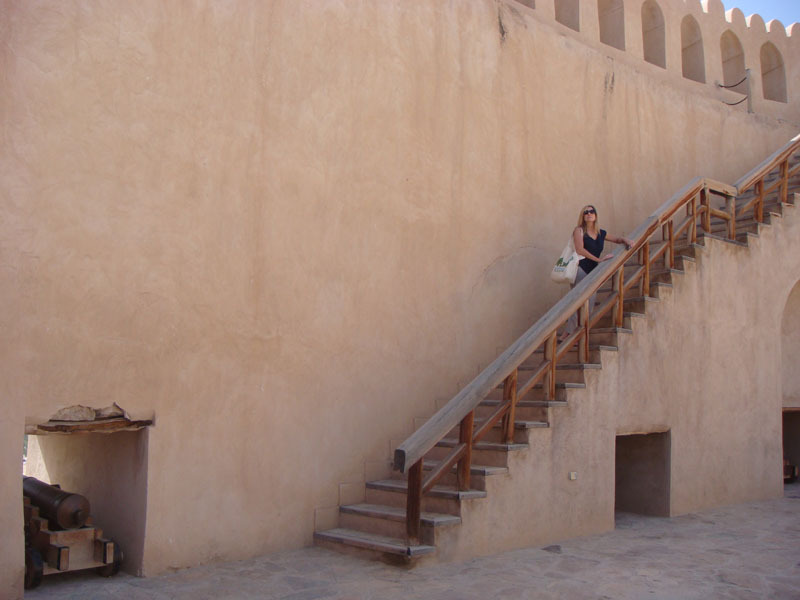 There are some German tourists sitting with their Omani guide at an outside table. Zaher asked us where we would like to sit. We preferred outside. At a table for about eight people a man sat by himself talking on the phone and having a coffee. We stood looking at him like starving children. He got up and offered us the entire table. After chasing him away we positioned the plastic lawn chairs to watch cars whiz by on Bahla’s main drag. We ordered fresh juice – mango with papaya and lemon with mint and opted for the Indian vegetarian plates while Zaher ordered fish with rice. Zaher excused himself to wash his hands. We used our Dettol wipes. The food came quickly. As Goldie and I polished our utensils, Zaher dug in with his hands mixing the fish and rice together. The food was fine and the entire meal was cheap enough for Zaher to some make money. The plates were about 1.8 riyals and the drinks were 1.2 riyals. During lunch, we made conversation. That explained why he was so pleased we brought our own guidebook. As we finished we asked where was a restroom to wash our hands. We were told it was in the back alley and needed a key. 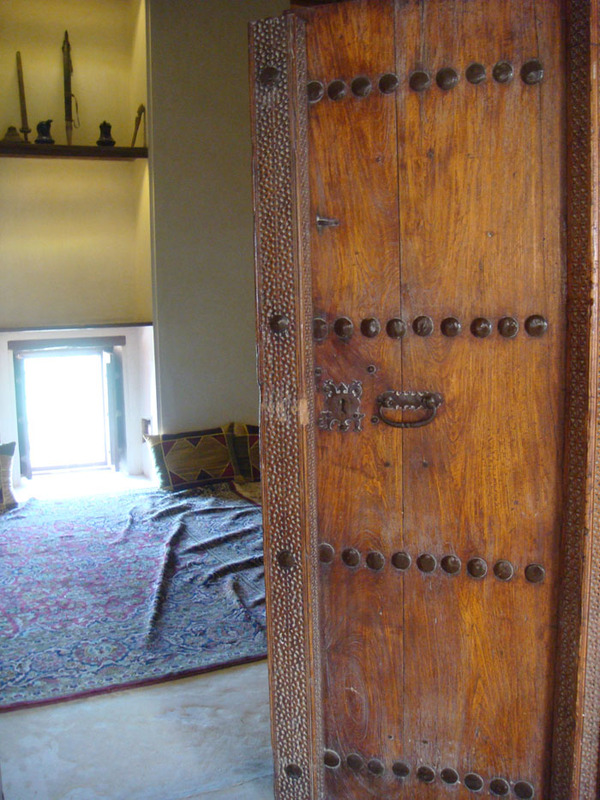 Iron doors with a sliding lock requiring a key made certain only the worthy entered. Inside there was no sink to wash my hands nor a place to set anything. Traditional hammams are fine as long as you are not lugging a big bag with you. After years of sitting at a desk, achieving the perfect balance while squatting and holding my purse off the floor ensured the potty experience was the most challenging event of the day. The sink was – of course – inside the restaurant’s dining room. We navigated through the filled tables to the Washing Area, a four-foot long, communal sink on the side of the dining room where people could wash just before eating. 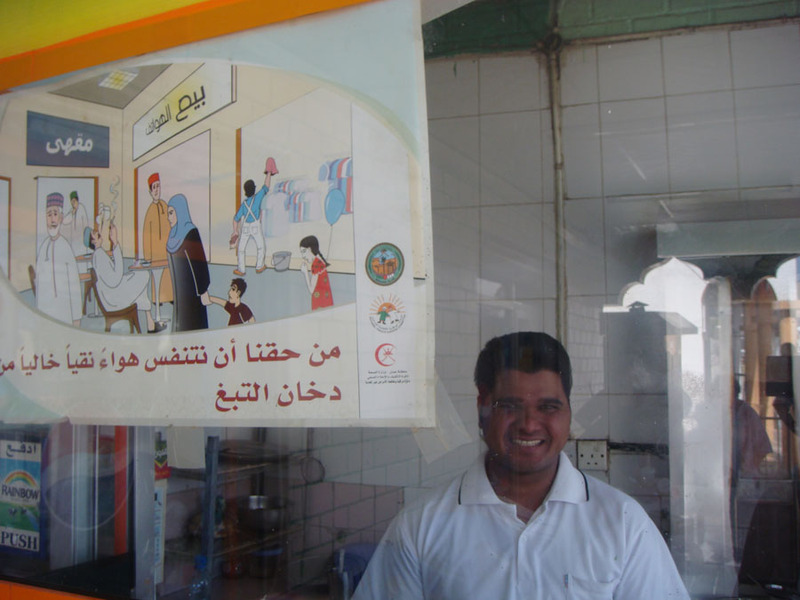 As we left, I took the photo of the man making naan bread and the government poster that I assumed said NO SMOKING. 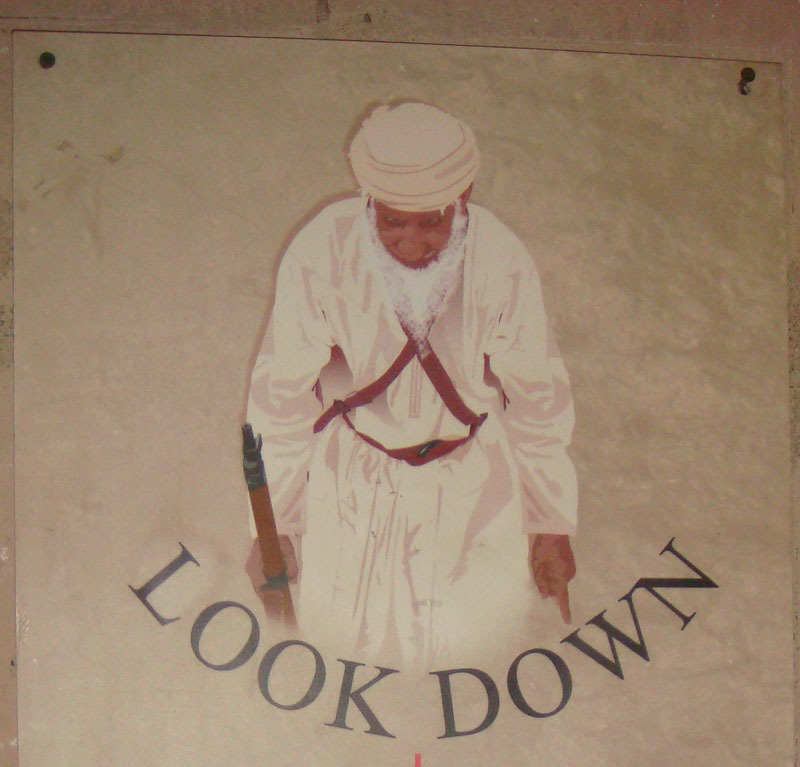 Onto Bahla Fort – ding, ding, ding. 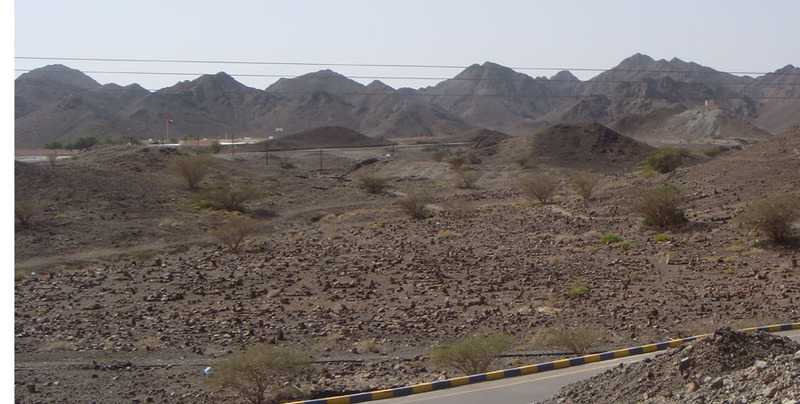 We drove to Nizwa about 140 kilometers from Muscat. 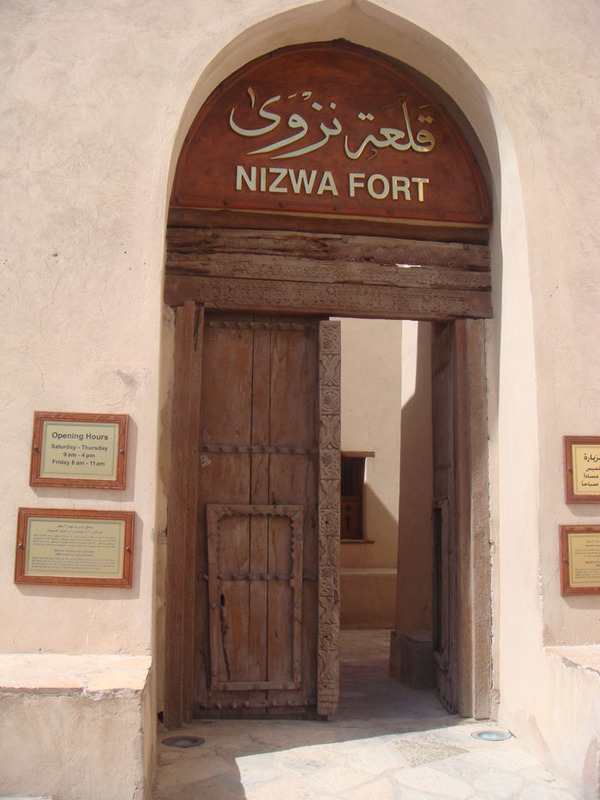 Nizwa was the capital of Oman during the sixth and seventh centuries. 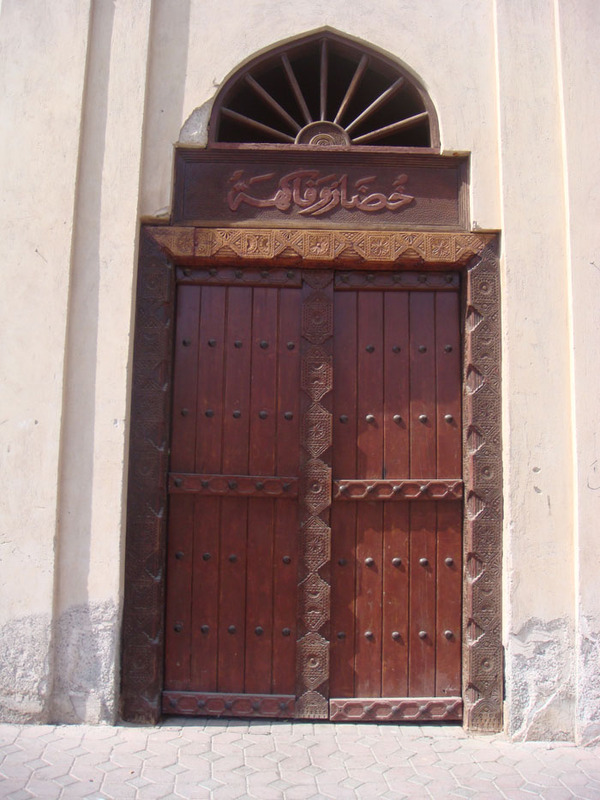 It also served as the cultural capital being known as the town of poets, writers, intellectuals, and religious leaders. 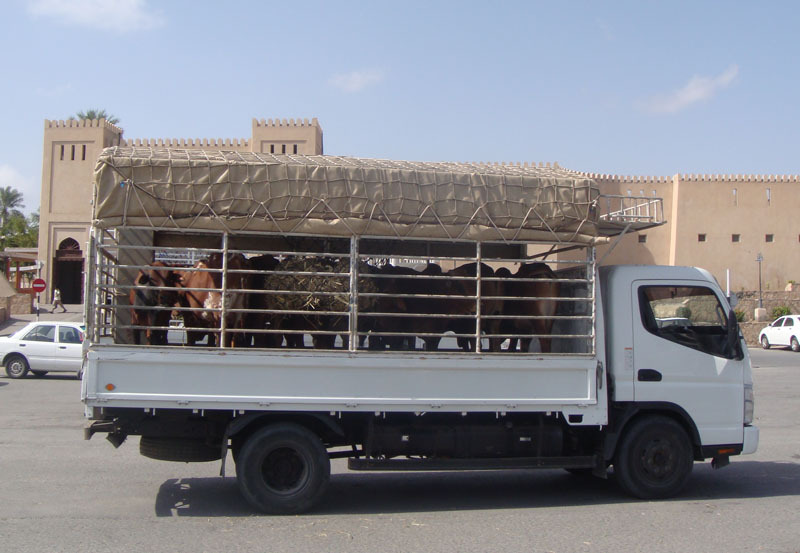 We did not stop at any libraries but instead parked in the souq parking lot. It was Thursday the day before the big Friday cow and goat sale. Goldi, a staunch vegetarian, had vetoed the Friday market visit as she did not want her dreams plagued with visions of what happened to the purchased goats. 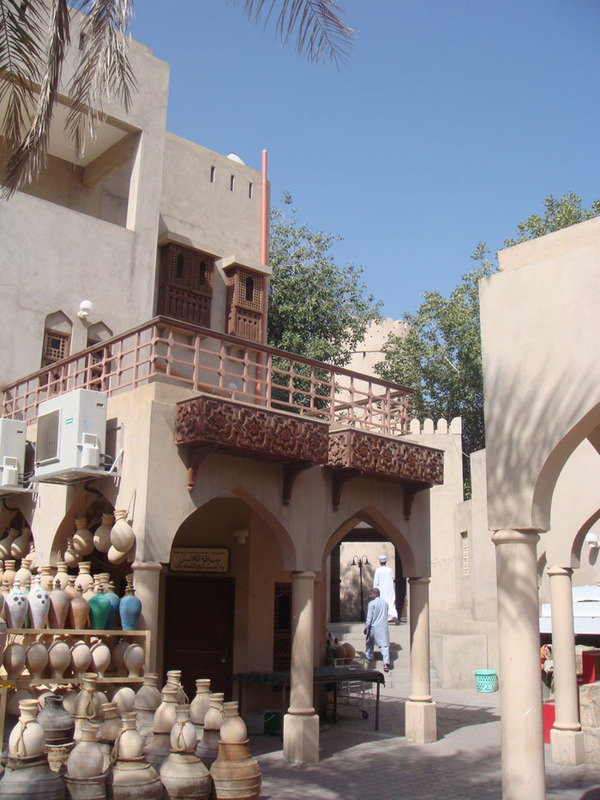 The animal, fish and vegetable souq is part of a typical tour. However, it was very quiet when we walked through the wooden gate. 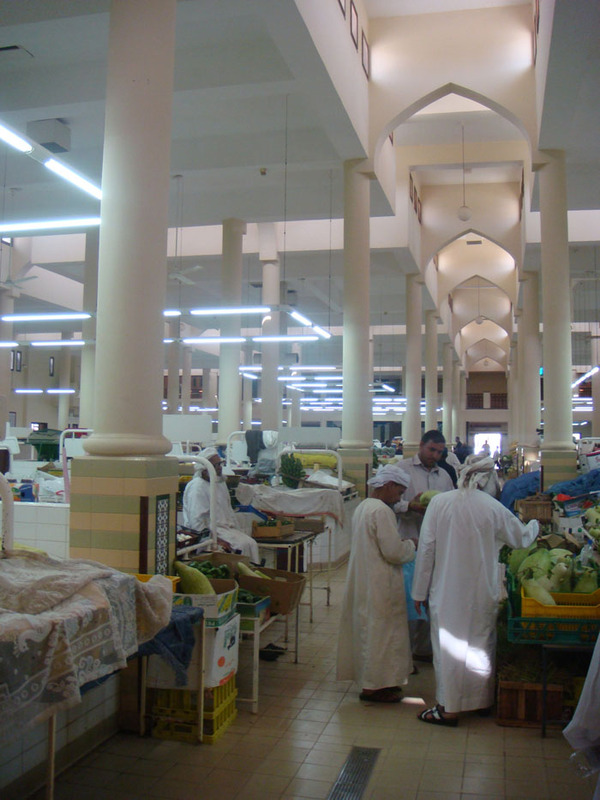 Inside the smell of slaughtered animals and blood in the street moved us quickly into air conditioned building with its brightly lit vegetable stalls. People were not bustling about. A few vendors sat patiently waiting for buses of tourists to come through, taste their halwa and hopefully purchase a kilo or two to carry home. Halwa is the Omani sweet. It is like thick paste made of dates with cardamom and decorated with pistachios. Both Goldi and I tried a piece. It was not overly sweet but my palate did not appreciate the jelly texture. Neither of us wanted another bite and declined the offer to buy any. At the next stall the man wearing the lavender thobe tempted me with his halwa. It had a re-useable tin bowl and cover. I nearly bought it for the container but decided carrying 5 riyals of heavy halwa in my suitcase, knowing no one in my family would eat it, was a waste of good luggage space. We succumbed to the elderly man selling cashews. Even after my purchase, he declined a photo. 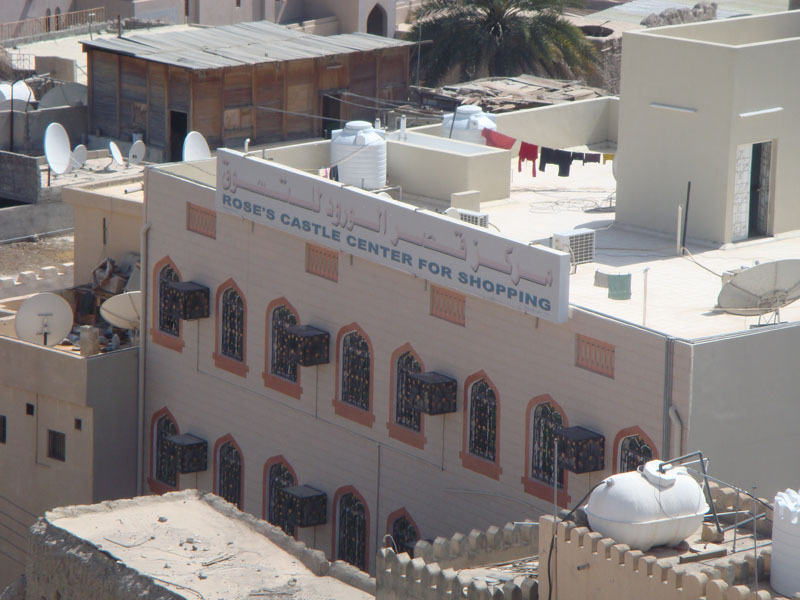 Outside the vegetable market was the entrance to a Nizwa street store just outside the Fort/Castle’s front door. 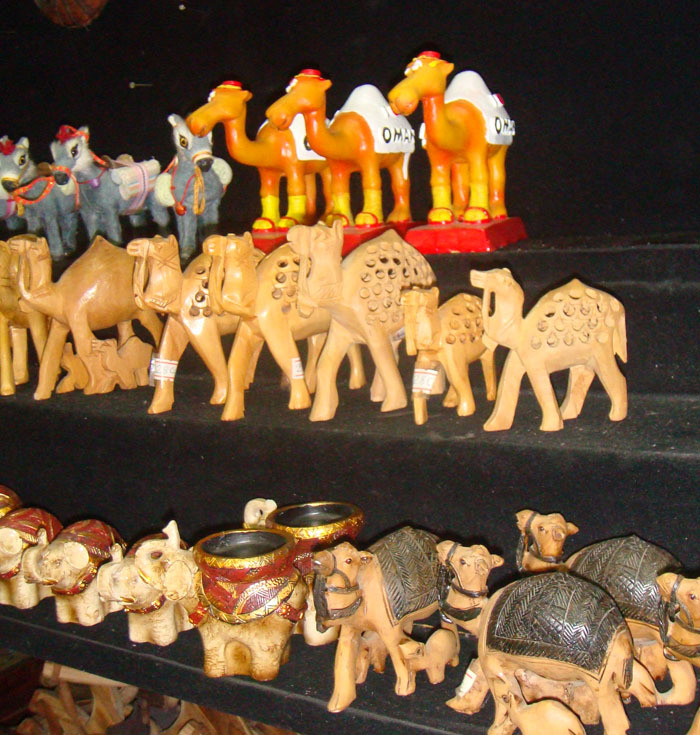 The shelves were filled with ceramic replicas of the fort. 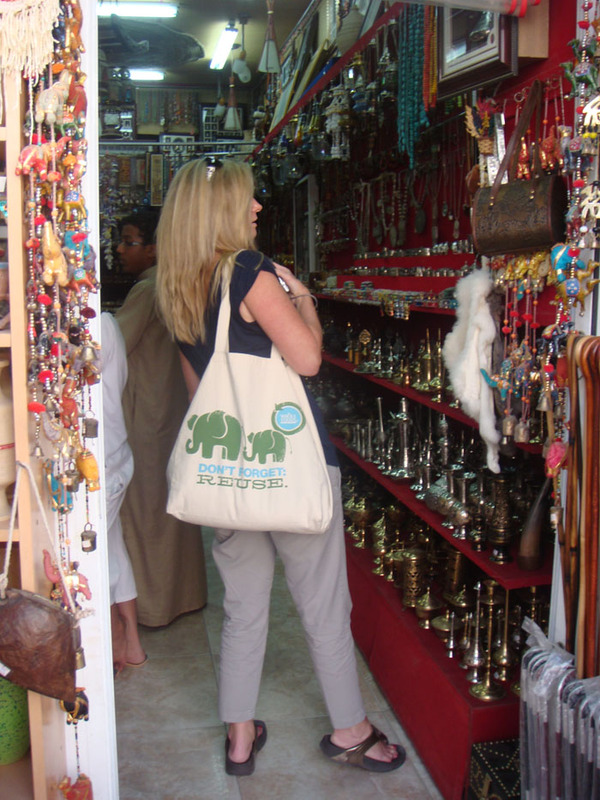 At first it looked enticing and we eagerly entered hoping to find the perfect souvenir. Silver daggers lined the walls. The jewelry cases were filled with traditional style necklaces made of semi-precious stones and silver beads. At first it looked fun but upon further examination the silver jewelry all began to look like very unwanted silver jewelry that had gathered dust there for years. The men sat bored, watching at us paw through the piles of trinkets. We found nothing. The jewelry was not modern enough to wear, nor special enough to hang up as decoration. My guess was it all came from India. We wandered outside. 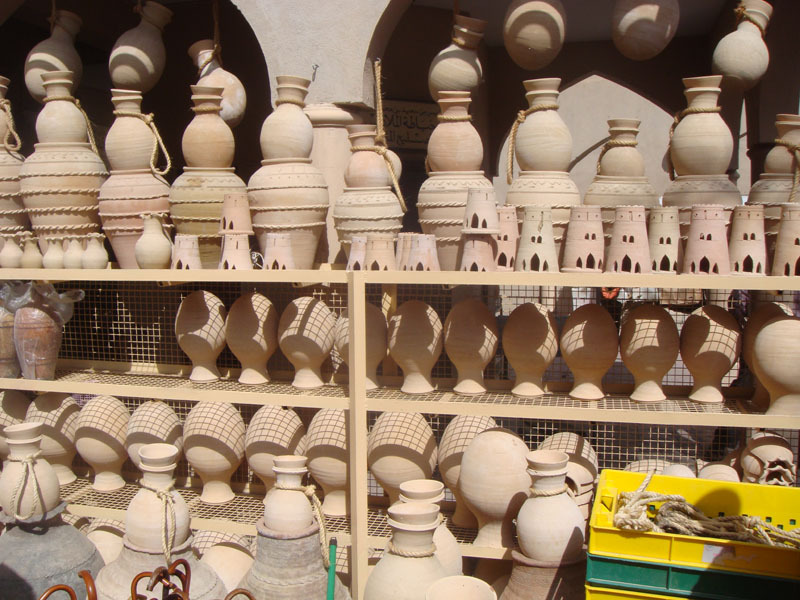 The crude clay pots were handmade and fired in wood burning ovens. They become hard but would not last forever. Nothing appealed to us. We walked towards the fort entrance and found another street filled with tourist treasure shops. Goldi led me into one that interested her. As I entered and took pictures of the camels, the shop keeper asked where I was from. “America.” I said smiling as I perused the shelves packed with every type of momento you could imagine. 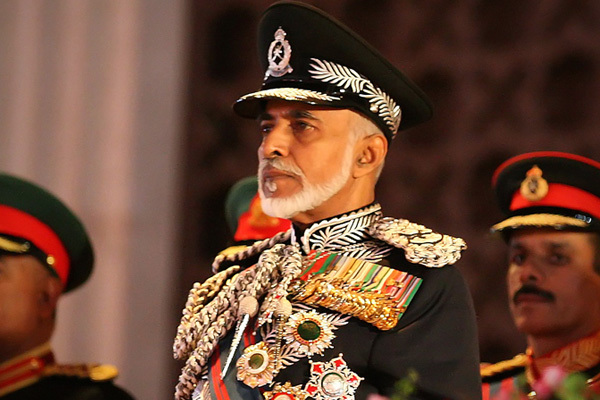 His Majesty Sultan Qaboos bin Said has led Oman since 1970 when he took power from his father. 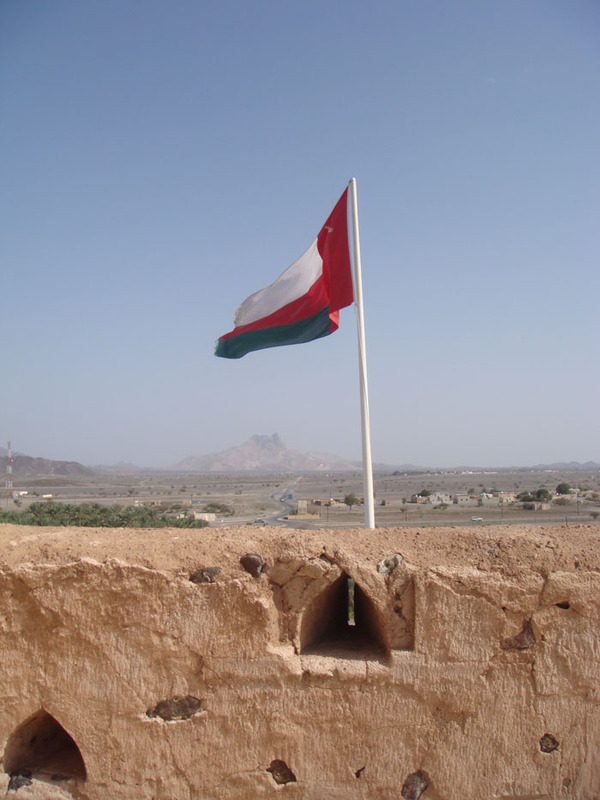 Oman’s absolute monarchy had been passed down through the male line of the Al Busaidi Dynasty for the past five generations after Sayyid Turki bin Said Bin Sultan overthrew the Ottoman Turks in 1744. 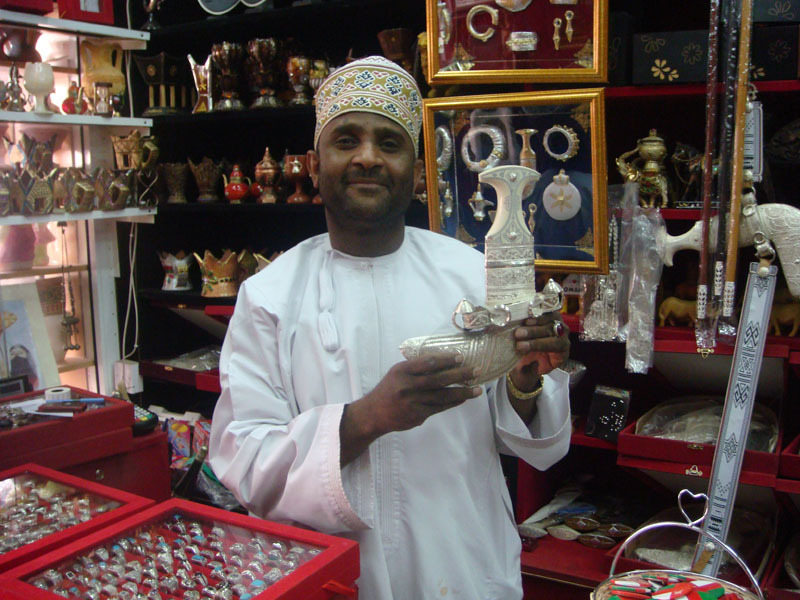 “You like Sultan Qaboos?” I asked curious whether the Sultan was as popular as he seemed. “Yes, we LOVE Sultan Qaboos. He has made many changes to Oman. Where are you from?” he directed his question towards my flaxen haired friend. “I don’t think he is governor anymore. No more Terminator for California,” he said. “Can I take your picture?” I asked. I wanted to remember this man. He reached into his shelves and pulled out a silver khanjar. It too looked new, probably recently made in India. He held it next to his cheek and posed for me. No money exchanged hands but we had a good time.